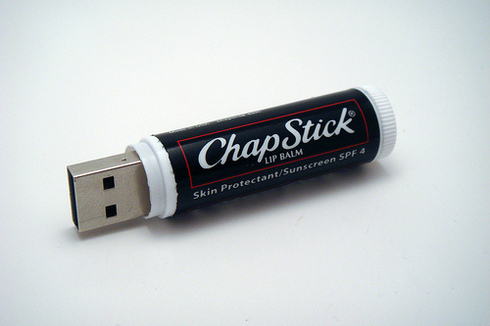 Photo of the week: Create a 2 gigabyte ChapStick as explained by The Machinist. Yahoo was recently granted a patent that could cause a bit of a shake-up to other web portal companies if acted on. The patent covers the ability to give users control over customized templates that are saved and stored on a host server and the idea that real-time information is stored on the host server and delivered to the user in the template. Google has started reporting subscriber counts for Google Reader and Google Personalized Homepage. What does this mean? This is one more data point to help you understand how many people have asked to receive your feed (aka "subscribers"). The number that Google is reporting is the total number of Google users who've subscribed to your feed in Reader or with Personalized Homepage. Somewhat Frank has seen a huge spike in subscribers via FeedBurner as Google products were previously not part of FeedBurner subscription counts. TechCrunch's subscriber count spike is even more glaring as it went from about 178K to 261K overnight. Thank you Google! Read/Write Web predicts the formula for the next web (web 3.0) will be as follows: 3C = Content, Commerce, Community | 4th C = Context | P = Personalization | VS = Vertical Search. Do you agree? Xdrive Shows is a new web-based application available on Xdrive that allows you to combine pictures and music into multimedia slide shows. Watch a Xdrive Shows demo here. Autocopy, a new feature in the latest version of the Xdrive desktop client software, enables automatic uploads of music and photos directly from your PC to your Xdrive account. Give Xdrive Shows and Autocopy a whirl here. Mobile Search Not That Hot? Andy Beal looks closely at a recent UK survey of mobile phone users which suggests that there may be no where near the amount of people using their cell phones for search as previously thought. Do you search the web on your mobile device? Stowe Boyd presented this past week at Lift on the topic of Building Social Applications. He has put his presentation slides out on the web for your viewing pleasure. VentureBeat reports on a new GPS device that will be connected to the Internet too. That is pretty sweet if you ask me. The device is expected to be priced within the $500 to $800 range, along with the existing leading GPS devices. Yahoo launched a new gamma version of Yahoo! Go for Mobile 2.0, after the new service initially launched in beta just a month ago. The gamma version enables users to search directly from maps and share oneSearch results, news articles and the service directly with friends. Josh Hallett recently found out the hard way that is you are using the paid wifi in the terminal and you open up a desktop-based RSS reader like NetNewsWire, the network assumes your flurry of RSS-grabbing activity is a suspicious event. Make Magazine just created a handy .pdf and video explaining how to perform your very own EggDrop. I haven't heard about an EggDrop in years, it brings back memories of middle school. So if you are bored or wants to do something different give an EggDrop a try.